Speaking of managing my Civil 3D style library, I’ve actually got a post scheduled to go live Thursday titled “Using MindManager to Track and Document Civil 3D Styles”. So if you’re curious about how to apply MindManager in a business environment tune in then. 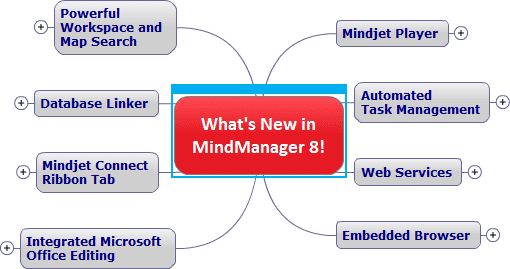 While I haven’t downloaded MindManager 8 yet, it really does introduce a number of very cool tools. It’s more tightly integrated with MS Office products, has some new automated task management tools, and can even connect to databases. If you haven’t gotten into the game of mind mapping, check out Mindjet’s MindManager. They have a 30 Day Evaluation available for download from their site, so you can try before you buy. Of course tune in again on Thursday for my MindManager & Civil 3D post. @Robin – You really do have a number of great posts about MindManager. Now that I have used, and become familiar with it, I too hope to get some more posts made about its use. @Stephen – No shame in that. I too toyed with the idea of mind mapping with FreeMind, and then evolved to MindManager. At first I was a bit of a skeptic, not fully convinced MindManager was worth it’s price. As you can probably gather, I was quickly convinced otherwise. Hi Donnie, I’m relatively new to this sort of software, but being a little “cheap” I opted for FreeMind – and now that I have used it, I don’t know how I lived without it! Next, onto a copy of MindManager for me.